Good article,Gary. John Byrne is a great writer and artist but I disagree with his ideas on the Hulk. It seems he wanted to use his back the original Lee/Kirby approach that he did with the Fantastic Four. While his reasoning made sense for that book it really does not for the first six issues of the Hulk. The original Lee/Kirby issues had trouble with making the Hulk a interesting character. It was not until Ditko's issues that we got a concept that was working. Even then it was awhile until any really good stories were done.His comments on Len Wein and his dislike for the savage hulk are odd. Wein was probably one of the best writers the series had. It seems in general there was a dislike for that version of the Hulk then. What are your thoughts? This was a very nice series. Byrne's run is something of a curiosity to me. I loved Mantlo's run but he had become stale near the end of his tenure, and Byrne's arrival was like a breath of fresh air. I don't think any of the issues he did are necessarily classics, and having re-read them a few years ago I don't think they've stood the test of time all that well. But I like a lot of the ideas set forth here as to where he was eventually headed. The notion of separating Banner from Hulk was always IMO a little goofy, but I love the idea of a "back to basics" approach with the Hulk in the shadows. 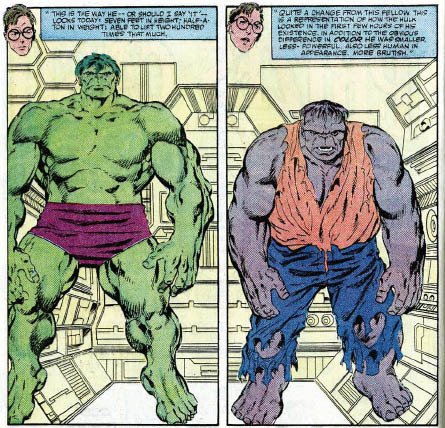 Very interesting to see how the elements of Hulk subconsciously influencing Banner eventually made their way into subsequent runs as well. Well done, Gary. Bravo! I appreciate what you've done here, and it's added both enjoyment and insight to my comics reading experience. An experience, I must admit, would probably be drastically different - if not nonexistent - had John Byrne stayed on the book. For all the respect he is due as a writer, it is the Hulk and his evolution through the Mantlo and David years that made me into the comics fan I am today. If not for the deep love I developed for the character during these stories, I may never have grown into such a big comics addict. Byrne following through with his plan may have ruined all of that, although we'll never know. I may not read your DC posts, my friend, but you really kept me glued with this one! Gary, this is a great series of articles. This is a subject I myself have thought of since the 80's. Question: Regarding the changed issue numbers that Byrne had annouced storylines that he didn't get to, did you find anything about how Byrne's storytelling choices might have provoked ire on Jim Shooter's part? Aside from the Chaptered 314, there was the alternating aspect of 318, which was really 2 unrelated stories alternating on the top and bottom of each page. Finally, the all splash page issue that Shooter didn't allow to published as 320. Shooter had and has a reputation for conventional storytelling which these examples flaunt a real disregard for. Is there anything you may have read that sheds light on Byrne's peculiar storytelling choices? Brian, thanks for reading! 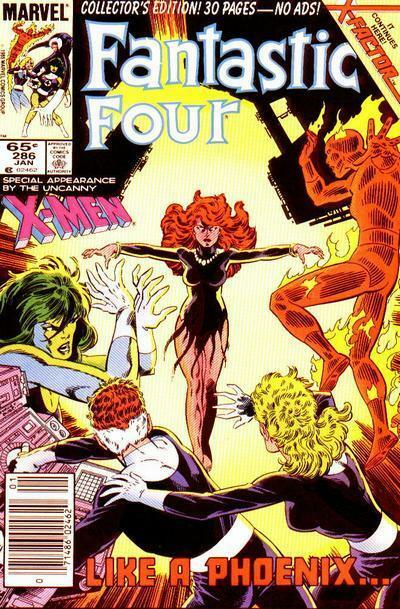 I never really considered the storytelling style as being the culprit that led to Byrne's dismissal from the title. Considering that Walt Simonson had an all-splash issue of THOR (#380) just over a year later, still under Shooter's tenure, I'm not sure how much credence I can give to the theory. Every article I've read and every comment from Mr. Byrne seems to suggest it was the stories themselves, and not the method he used to tell them, that led to Shooter taking him off the book. However interesting it seems that the "3 chapter" structure was the very first casualty (in his 2nd issue), I don't think it's a symptom of later problems. Gary, if you remember I wrote a article about the Old Power awhile back. I said it may be more than coincidence that the Hulk landed on Skaar. Read the last paragraph of this link and notice the aliens in the last few preview pages. Great series! I have often dismissed Byrnes run as a failure, but after you've shown the ideas and plotlines established that future writers built on I have to reevaluate Byrnes Hulk. That being said, do you have any insights on Byrnes second, just as short, run on Hulk in 1999-2000 which was hyped to the extent that Marvel decided to re-number and re-name the Hulk title, but then just seemed to fizzle? Christian, thanks for reading! As far as the later Byrne run, I've heard a few things. 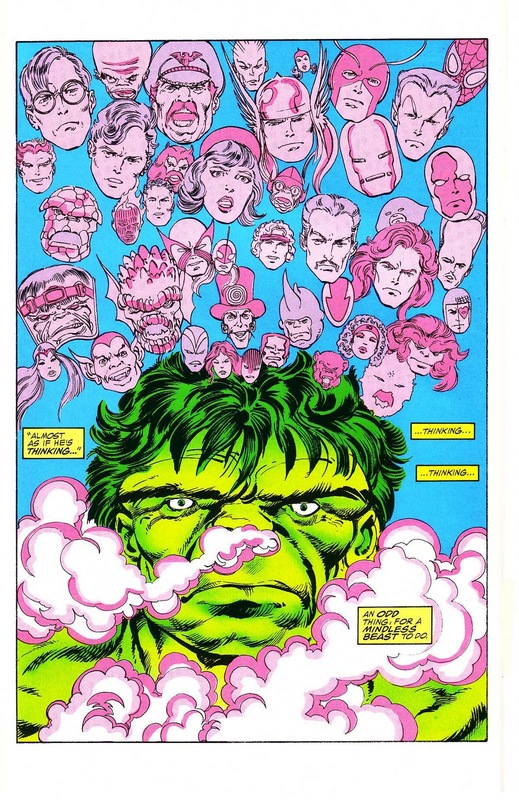 I know it was designed as a showcase for the savage Hulk, which is what Marvel wanted in the wake of Peter David's departure (in fact, it's why David walked from the book). 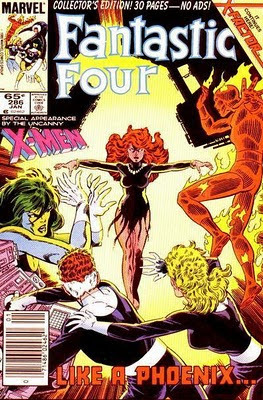 It was originally supposed to start with issue #475 according to some Marvel promotional material, but at some point relaunching/renumbering became de rigueur at The House of Ideas, and we got a new #1. As far as I know, there was no plan to return to Byrne's earlier ideas, although certainly there's the germ of the idea there (with the Moloid-turned-Hulk who destroyed the airplane in #4). When the editorial team turned over (Matt Idelson out, Tom Brevoort in) Byrne was cut out of the puzzle almost immediately, and first Erik Larsen (#8) then Jerry Ordway (#9-11...coincidentally Byrne's finisher in the later FF issues) came in to conclude the arc. I know Byrne really refuses to discuss this period on his message board, which is really something because he's even discussed the earlier parting with Jim Shooter. I could guess the storytelling style had something to do with the decision, as issues #1-5 essentially were all different POVs of the same action with some advancing of the plot here and there. The sales figures started out just under 78K but plummeted month after month, hitting a low of 44K with #7, not seeing a turnaround until the Wolverine guest appearance in #8 (plotted by Byrne, scripted by Larsen), and not really stabilizing until the book was retitled "Incredible" and Paul Jenkins took over (granted, that floor was in the upper 30Ks). Gary, do you have a source that Byrne plotted Hulk #8? The comments Larsen made that I have read seemed to indicate that he was plotting. I'm pretty sure I remember him stating that he came up with Wolverine Blinding the Hulk, because without a handicap, he couldn't imagine a fight between a non-adamantium Wolverine and a savage Hulk being able to last an issue. I have wondered about this because Larsen uses the Tyrannus subplot and points out that Tyrannus doesn't know who built the subterranian devices he uses to control the Hulk and siphon his power. 12 years later and we still don't know. Eep! I could have sworn I remembered a plot credit of some sort in Hulk #8 and believed more than a bit of the issue had been worked on previous to Byrne being let go...I guess either I'm wrong or the source has been lost. (Let's put it this way: if Byrne ever did have any plot involvement, it's been so overwritten by Larsen as to render any credit meaningless.) Either way, mea culpa. Good point about Tyrannus being unaware of who built the devices he used to enslave the Hulk! On the topic of credit, remind me to dig some things up on the Hulk creative team that never was: Todd Dezago and Mike Wieringo! Gary,in what issue did Tyrannus say he did not know who made the technology? Most of the technology that he has was originally developed by the Deviant race. This has been said in a few different issues. What reason did Tyrranus have to believe that this technology also was not made by them? Gary, as always superb work - beautifully researched! There is no reason that the SWII appearance could not occur after the Marvel Fanfare issue. After meeting the Beyonder, the Hulk gets so mad again that he once more reverts to his previous state. Indeed, the Hulk is silent in the following SWII issue. "Can you imagine never involving MPD/DID in the Hulk legend? Never having a "merged" incarnation? " As you are probably aware, Hulk was originally meant to be grey from the start. But due to limitations of the color printing process used by Marvel back then, it was impossible to get the grey color right. On one page his grey had for some reason turned into green, and so Lee decided he should be green instead since this was a color the printing process could handle. The next time we saw the grey Hulk was during one of the Crossroads adventures after Doctor Strange deported the then mindless Hulk to the crossroads dimension. In a short glimpse in a single frame of flashbacks, we see the grey Hulk for the first time in years. Great article. Sorry I'm coming in on this really late. 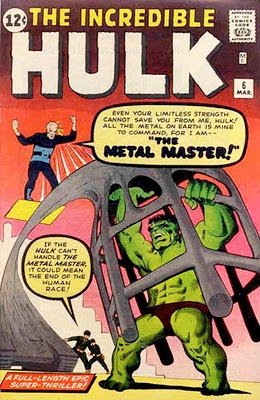 From what I've heard the original Hulk was going to be killed by the Hulk statue being controlled by the Metal Master. 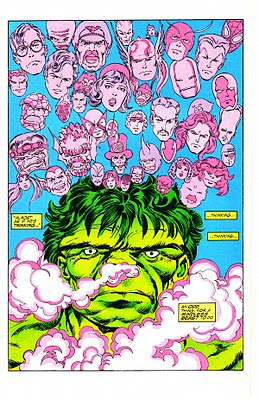 I heard Byrne left because the editors thought that the single panel splash pages for Hulk 320 was a rip off for fans which is ironic since they published the story in Marvel Fanfare which was a more expensive comic. Man I wish Byrne had stayed. Thanks for all the information. Ironically, I'm finding this 4-part study after having just read the first 13 issues of Immortal Hulk, which seems to have successfully done everything laid out in Byrne's vision. Did Al Ewing have access to Byrne's plans? Who knows, but as I read through the pages of Immortal Hulk, all I kept thinking was... brilliant. Brilliant. Brilliant. I grew up reading Byrne's Superman, and it led me to go back and find some choice bits of his X-Men run. I have She Hulk in my sights next, and I can't wait. He was a brilliant writer in his heyday, and it appears (whether intentionally or not) that his ideas continue to resonate. Thanks again for the info - however late I may be in finding it!